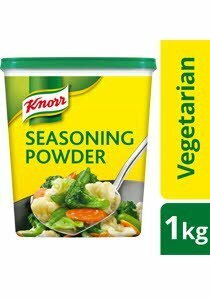 A versatile seasoning perfect for enhancing the natural flavour of your vegetable dishes. Salt, Flavour Enhancer (E621, E635), Lactose (Milk Derivative), Cornflour, Maltodextrin, Sugar, Hydrolyzed Vegetable Protein, Soy Sauce (Soy Bean, Wheat, Salt, Maltodextrin, Modified Starch, E621, E917), Palm Fat, Spices. All food additives used are from plant origin. Made on equipment that also makes products which contain cereals containing gluten, fish, crustacean, egg, mollusc, peanut and tree nut.